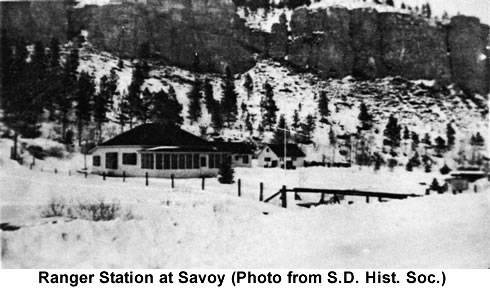 Camp Savoy was located about 22 miles south of Spearfish on the Spearfish Canyon Road (alternate U. S. Highway 14) and then west on Road 222. 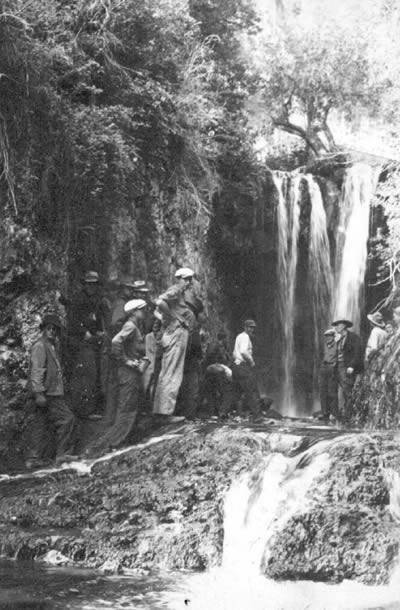 The camp was located between two huge bluffs of limestone one mile from Roughlock Falls near Little Spearfish Creek (1935). 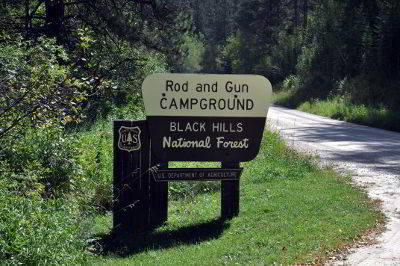 It may have been near the site of the Rod and Gun camp ground. 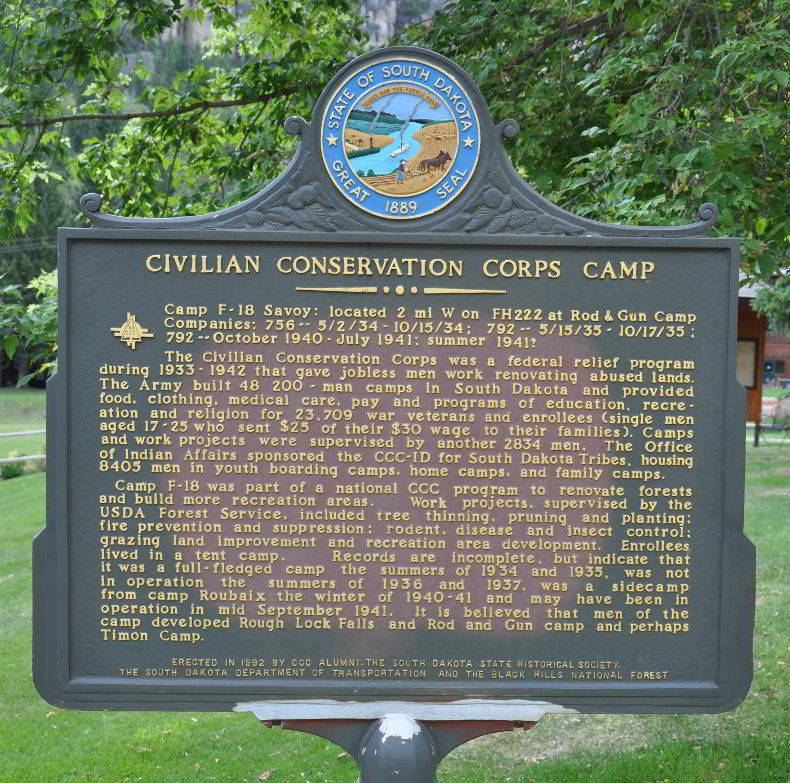 The tent camp was occupied by CCs during several summers, but records were only located for 1934 and 1935. Companies at Camp Savoy: 756--4/26/34-10/15/34, 792--5/15/35-10/35. 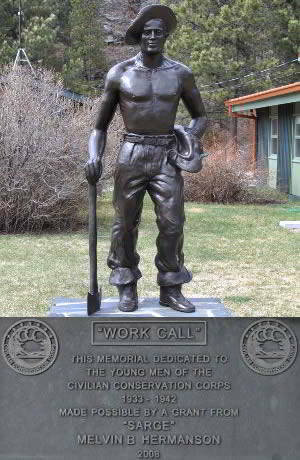 Company 756: The Nebraska Company was organized on May 17, 1933, at Fort Crook, NE. It was stationed at a camp near Coquille, OR, from June 11, 1933, until April 1934 (1937). Camp P-207 (Coquille) was a forestry camp and the company built roads, lookout towers, and telephone lines and fought forest fires (1937). Though several army officers served with the company, Theodore S. Koziatek, Capt. Inf. Res., was commanding officer and Edward Senn, 1st Lt. Inf. Res., was junior officer when the company moved to Camp Savoy (1937). On April 26, 1934, an advance detachment of 20 men was sent to Savoy to establish a summer camp. On May 1, the remainder of the company followed, and 2 days later 65 men arrived from Fort Crook, NE. On May 17, the company received its first educational adviser, Mr. Arthur L. Barth (1937). The June-July re-enrollment period affected the discharge of 80 men and the enrollment of 125. On September 8, 1934, Capt. Koziatek was transferred to Company 793. Edward L. Senn, 1st Lt. Inf. Res., acted as commander until the next day when he was relieved by H. Ray Kingsley, Capt. Eng. Res. (1937). The work at Camp Savoy was much the same as that done in Oregon. 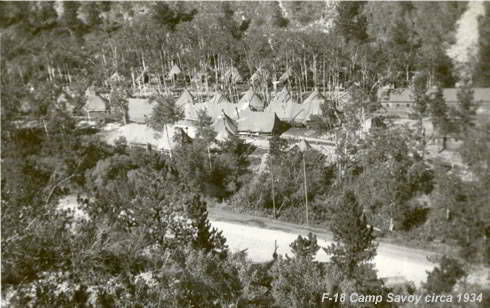 A ranger station was constructed at Savoy, side camps were maintained at Tinton and Bear Lake, and a detachment of 10 men was sent to Fort Meade (1937). The Company was transferred to Nelson, NE, reaching there on October 16, 1934 (1937). Company 792: Organized May 18, 1933, the company was assigned to Camp F-6 (Roubaix). Except for the summer of 1935 it was at Roubaix from June 3, 1933, until 1940 and perhaps later. On the morning of May 15, 1935, a long convoy of army trucks transferred the company to Camp Savoy. 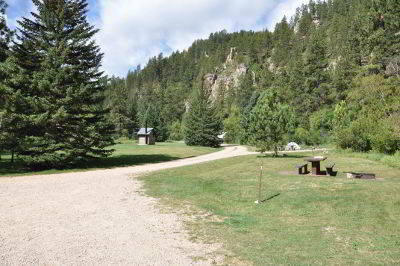 Tents were arranged in parallel rows with Little Spearfish Creek wending its way close by the camp. The many thrills of fishing, exploring, and beautifying the primitive country will long be remembered by the officers, foresters, and enrollees (1937). On August 1, 1935, Lt. L. Hutton was transferred from Camp Mayo to take command of Company 792. He replaced Lt. Bridenstine who was transferred to the southern Hills (1937). Just as the early frost touched the leaves and changed the landscape to resemble some vast beautiful picture, the company again returned to its home at Roubaix (1937).